For most of the 1990s and the subsequent decade, a substantial majority of Americans believed it was more important to control gun ownership than to protect gun owners’ rights. But in December 2014, the balance of opinion flipped: For the first time, more Americans say that protecting gun rights is more important than controlling gun ownership, 52% to 46%. Why has public opinion shifted about gun control? As my colleagues at Pew Research Center have documented elsewhere, some of this is related to politics, as Republicans have become far more supportive of gun rights during the Obama years. The rise in support for gun rights has also spanned many other regional and demographic groups. But there may be another factor behind this shift: Americans’ changing perceptions about crime. Over the past 25 years or so, there has been a divergence between American perceptions about crime and actual crime rates. And those who worried about crime had favored stricter gun control; now, they tend to desire keeping the laws as they are or loosening gun control. In short, we are at a moment when most Americans believe crime rates are rising and when most believe gun ownership – not gun control – makes people safer. In the 1990s, the rate of violent crimes plummeted by more than half nationwide. 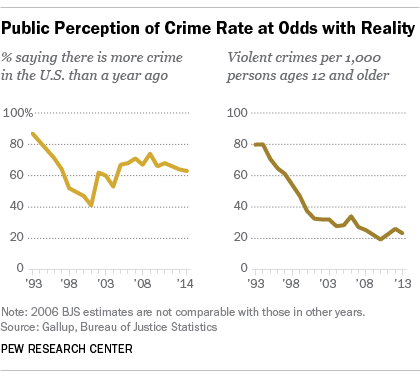 Public perceptions tracked right along, with the share saying there was more crime in the U.S. over the past year falling from 87% in 1993 to just 41% by 2001. In the new century, however, there’s been a disconnect. A majority of Americans (63%) said in a Gallup survey last year that crime was on the rise, despite crime statistics holding near 20-year lows. Why public views on crime have grown more dire is unclear, though many blame it on the nature of news coverage, reality TV and political rhetoric. Whatever the cause, this trend is not without consequence. Today, those who say that crime is rising are the most opposed to gun control: Just 45% want to see gun laws made more strict, compared with 53% of those who see crime rates as unchanged or dropping. That’s not the way people thought 25 years ago. Not only was support for stricter gun regulation far higher overall in 1990, but it was also somewhat higher among those who felt crime was on the rise. People who thought crime rates were increasing were 9 percentage points more likely than those who saw crime rates as stable or decreasing to support stricter gun control laws. Today, they are 8 points less likely to support stricter gun control laws. And when we analyze the numbers, this trend is especially pronounced among whites. 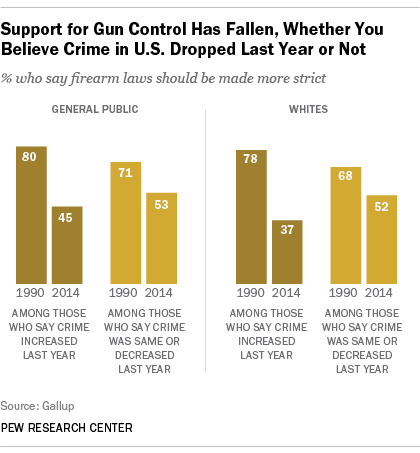 Support for gun control has dropped most dramatically among whites who see crime on the rise – just 37% of those who now say crime is increasing say they favor stricter gun control, compared with 78% who said the same in 1990. Among whites who do not see crime growing, that decline has been much more modest, from 68% supporting stricter gun laws to 52% today. While Gallup’s survey sample among non-whites was not large enough to provide a comparison, generally non-whites have remained more supportive of gun control. Other recent data confirm this pattern. A 2013 Pew Research survey showed that protection is now the top reason gun owners offer for why they choose to own a gun (in 1999, hunting was the top reason). And among the public at large, the latest Gallup survey finds that 63% of Americans now say having a gun in the home makes it a safer place compared with 30% who say it makes a home more dangerous. 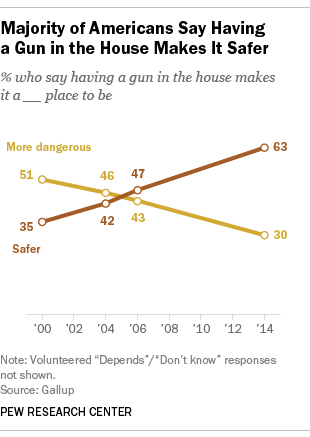 Fifteen years ago, more said the presence of a gun made a home more dangerous (51%) than safer (35%).